Ships tomorrow if you order in the next 20 hours 54 minutes. Auto Ship & Earn + 168 Points What's this? L-tyrosine: Precursor to catecholamines including dopamine, norepinephrine, and epinephrine. Catecholamines released by the sympathetic nervous system regulate the stress response and downregulate immune activation (7,8). L-methionine: Precursor to S-adenosylmethionine (SAMe) (13). SAMe is directly involved in methylation processes including catecholamine synthesis (14). Huperzia serrata aerial parts (1% huperzine A): Huperzine A slows the breakdown of acetylcholine by inhibiting acetylcholinesterase (AChE) (15). 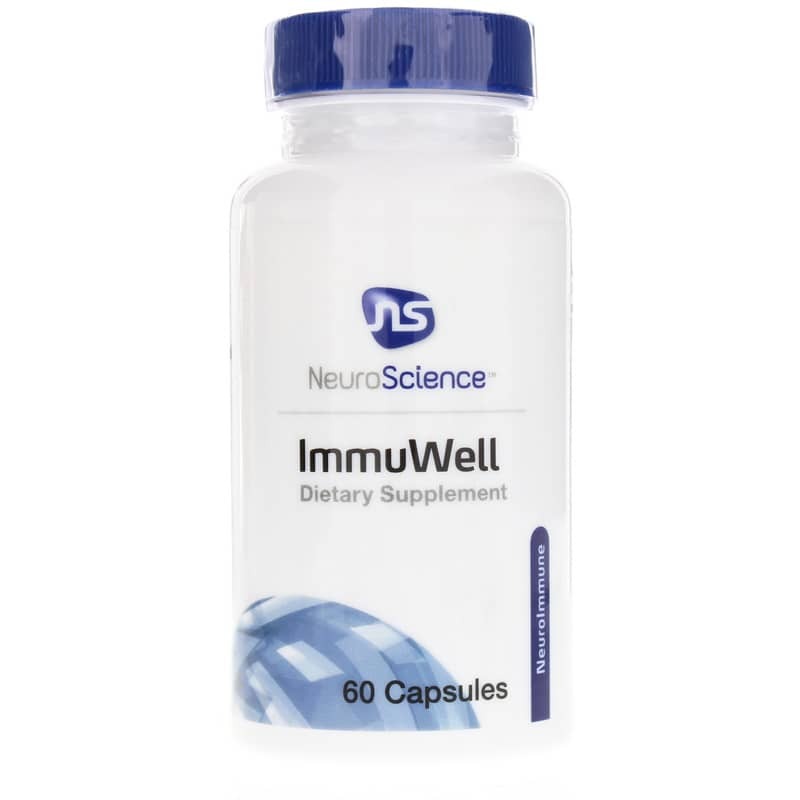 * Acetylcholine is the primary neurotransmitter of the parasympathetic nervous system important for regulating the immune system, learning and memory (16,17). 1. Liu X, et al. Restor Neurol Neurosci. 2013;31(2):109-23. 2. Sheikh N, et al. J Ethnopharmacol. 2007;111(3):671-6. 3. Kamkaew N, et al. Phytother Res. 2013;27(1):135-8. 4. Rastogi M, et al. Biogerontology. 2012;13(2):183-95. 5. Stough C, et al. Phytother Res. 2008;22(12):1629-34. 6. Stough C, et al. Psychopharmacology (Berl). 2001;156(4):481-4. 7. Pongratz G and Straub R. Arthritis Res Ther. 2014;16:504. 8. Lee D, et al. BMB Rep. 2015;48(4):209-16. 9. Gennara A and Haeggstrom J. Adv Immunol. 2012;116:51-92. 10. Schweizer S, et al. J Nat Prod. 2000;63:1058-61. 11. Radmark O, et al. Biochim Biophys Acta. 2015;1851(4):331-9. 12. Prabhavathi K, et al. Indian J Pharmacol. 2014;46(5):475-9. 13. Duncan T, et al. Mol Nutr Food Res. 2013;57(4):628-36. 14. Mischoulon D and Fava M. Am J Clin Nutr. 2002;76(5):1158S-61S. 15. Tun M and Herzon S. J Exp Pharmacol. 2012;4:113-23. 16. Tracey K. Nat Rev Immunol. 2009;9(6):418-28. 17. Drever B, et al. Behav Brain Res. 2011;221(2):505-14. 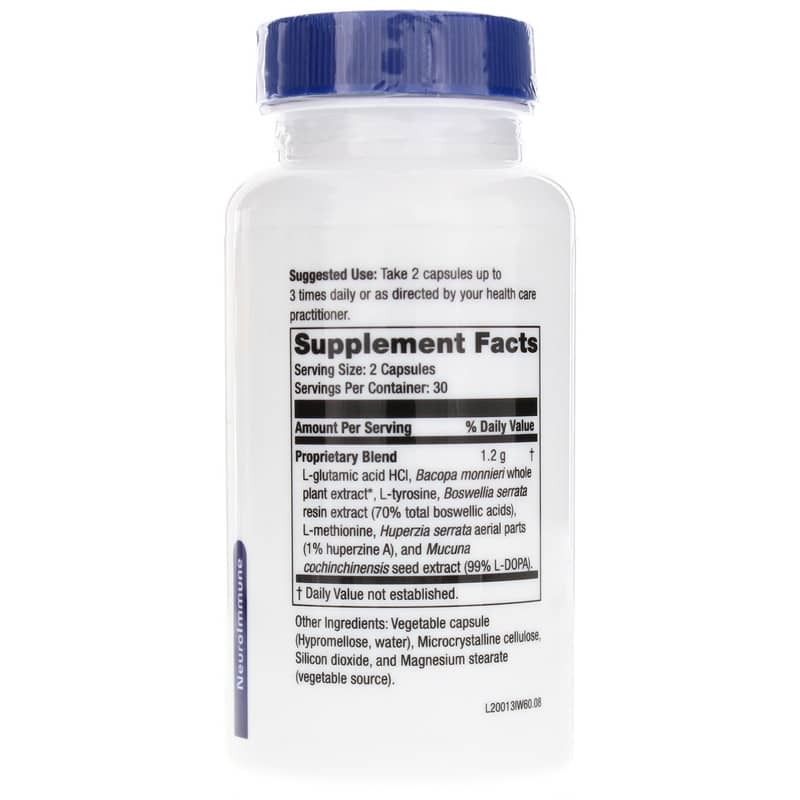 ---L-glutamic acid HCl, Bacopa monnieri whole plant extract, L-tyrosine, Boswellia serrata resin extract (70% total boswellic acids), L-methionine, Huperzine serrata aerial parts (1% huperzine A), Mucuana cochinchinensis seed extract (99% L-DOPA). Other Ingredients: Vegetable capsule (hypromellose, water), microcrystalline cellulose, silicon dioxide and magnesium stearate (vegetable source). 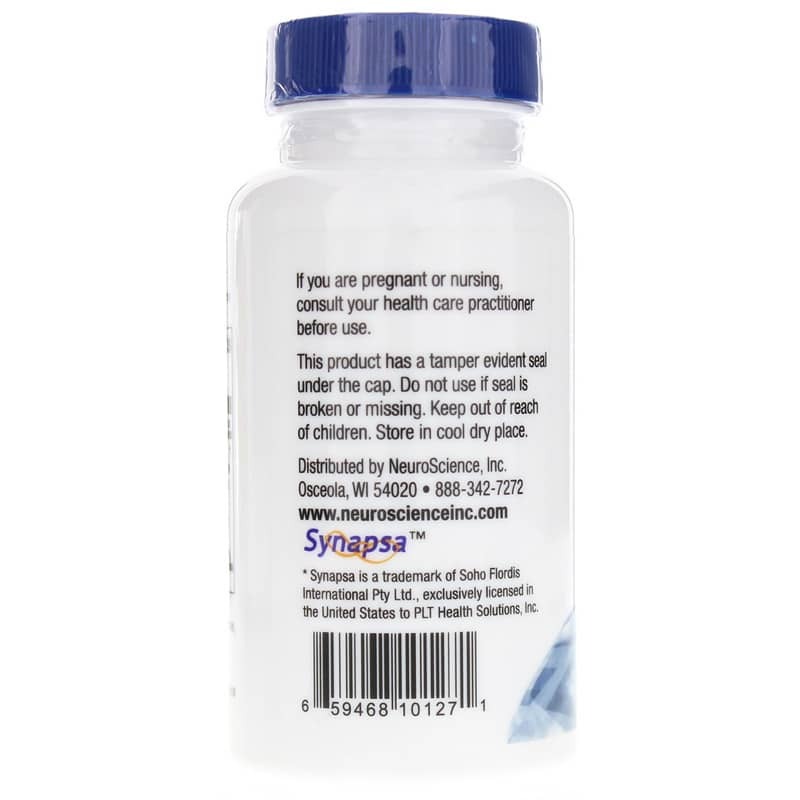 Adults: Take 2 capsules up to 3 times daily or as recommended by a healthcare professional. If you are pregnant or nursing, consult your healthcare practitioner before use. Keep out of the reach of children.